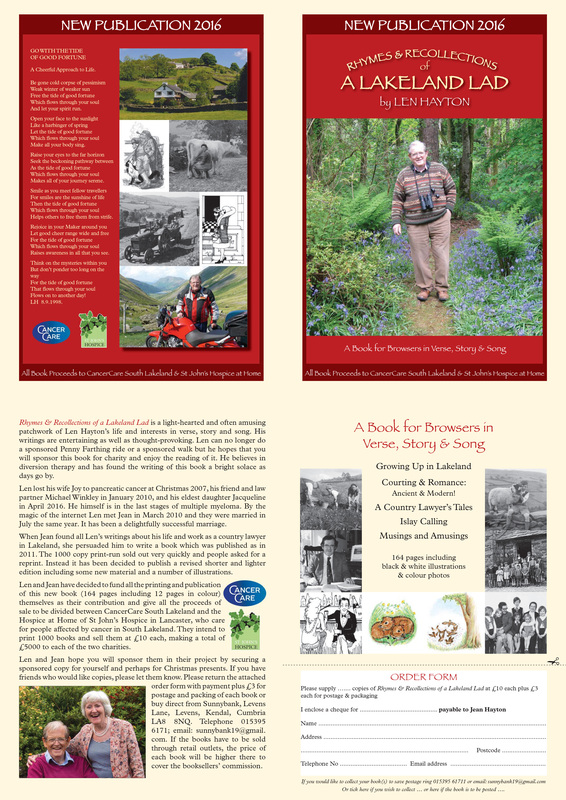 Retired Windermere solicitor Len Hayton is set to release “Rhymes & Recollections of a Lakeland Lad” which is a light-hearted and often amusing patchwork of Len’s life and interests in verse, story and song. His writings are entertaining as well as thought-provoking. Len can no longer do a sponsored Penny Farthing ride or a sponsored walk but he hopes that people will sponsor this book for charity and enjoy the reading of it. He believes in diversion therapy and has found the writing of this book a bright solace as days go by. Len lost his wife Joy to pancreatic cancer at Christmas 2007, his friend and law partner Michael Winkley in January 2010, and his eldest daughter Jacqueline in April 2016. He himself is in the last stages of multiple myeloma. By the magic of the internet Len met Jean in March 2010 and they were married in July the same year. It has been a delightfully successful marriage. When Jean found all Len’s writings about his life and work as a country lawyer in Lakeland, she persuaded him to write a book which was published as in 2011. The 1000 copy print-run sold out very quickly and people asked for a reprint. Instead it has been decided to publish a revised shorter and lighter edition including some new material and a number of illustrations. Len and Jean have decided to fund all the printing and publication of this new book (164 pages including 12 pages in colour) themselves as their contribution and give all the proceeds of sale to be divided between the Hospice at Home team at St John’s Hospice and CancerCare. Len and Jean have limited the print run to 1000 books which are on sale at only £10 each, which they hope will make an amazing total of £5000 to each of the two charities. If you would like to support them in their project you can by purchasing a copy for yourself and perhaps even buying as a Christmas presents for loved ones. If you have friends who would like copies, please let them know too. You can download an order form here, purchase them from either of the St John’s Hospice shops in Kendal, or at the hospice, or buy direct from Jean by contacting on 015395 61711 or via email [email protected].